Democratic National Committee doesn’t hold anything down when it dropped a 5-megaton bomb on Ivanka Trump this week. DNC Spokesperson Elizabeth Renda issued a statement this week calling out first daughter and White House special adviser Ivanka Trump’s “blatant hypocrisy” in promoting the Trump administration’s “Hire American” initiatives. Titled: “Ivanka Trump is a Hypocrite,” the statement was published on the DNC website Thursday (19 July 2018) and is one of the strongest rebukes of Ivanka yet. 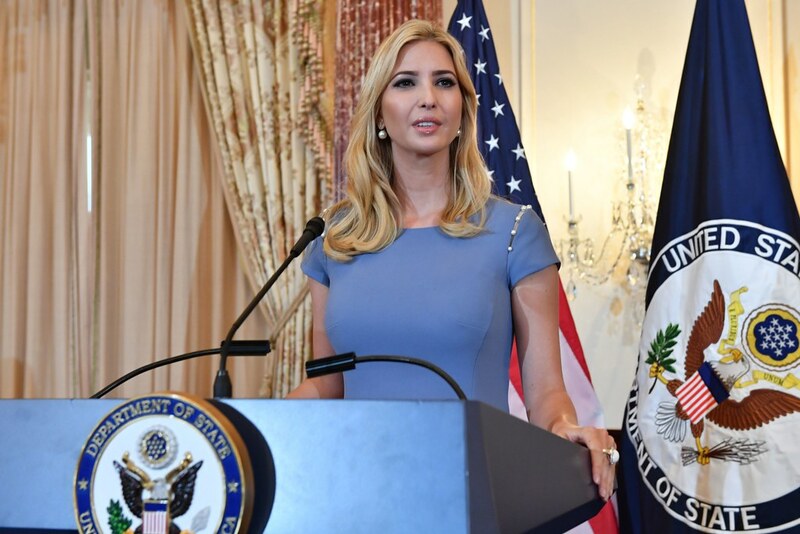 While Ivanka Trump is busy writing op-eds calling on American companies to ‘create more jobs, strengthen our economy and restore hopeful futures to countless families,’ workers in countries like Indonesia, China, Vietnam, Bangladesh, and India are busy too – working in conditions below industry standards to manufacture clothing and shoes for the first daughter’s namesake brand. The first daughter and special adviser to the president loves to portray herself as a champion for working women, but one look inside the overseas factories where she chooses to manufacture her products proves that she is anything but. The women manufacturing ‘Ivanka Trump’ clothes and shoes are paid so little that many of them are forced to live without their own children. The American people will not be fooled by the Trumps’ political publicity stunts calling for the creation of more American jobs, and they won’t fall for Ivanka’s faux feminism. The reality of how this family runs its own businesses is clear: choosing not to buy American, hire American, or make meaningful investments in American workers. The remainder of the statement included a series of direct quotes from powerhouse media companies speaking out about Ivanka Trump. In China… assembly-line workers produce Ivanka Trump woven blouses, shoes and handbags. Laborers in Indonesia stitch together her dresses and knit tops. Suit jackets are assembled in Vietnam, cotton tops in India and denim pants in Bangladesh… And in Ethi­o­pia, where manufacturers have boasted of paying workers a fifth of what they earn in Chinese factories, workers made thousands of pounds of Ivanka Trump-brand shoes. The reality of working in a factory making clothes for Ivanka Trump’s label has been laid bare, with employees speaking of being paid so little they cannot live with their children, anti-union intimidation and women being offered a bonus if they don’t take time off while menstruating. The Guardian has spoken to more than a dozen workers at the fashion label’s factory in Subang, Indonesia, where employees describe being paid one of the lowest minimum wages in Asia and there are claims of impossibly high production targets and sporadically compensated overtime.